(audio) (help·info), al-Quds, lit. "The Holy"; Yiddish: ירושלים) [ii] is the capital[iii] of Israel and, if including the area and population of occupied East Jerusalem, its largest city in both population and area, with a population of 763,800 residents over an area of 125.1 km2 (48.3 sq mi). [iv] Located in the Judean Mountains, between the Mediterranean Sea and the northern edge of the Dead Sea, modern Jerusalem has grown far beyond the boundaries of the Old City. The city has a history that goes back to the 4th millennium BCE, making it one of the oldest cities in the world. Jerusalem is the holiest city in Judaism and Christianity and has been the spiritual center of the Jewish people since c. 1000 BCE, when David the King of Israel first established it as the capital of the Jewish Nation, and his son Solomon commissioned the building of the First Temple in the city. Jerusalem contains a number of significant Christian sites, and although it is never mentioned explicitly in the Qur'an, Islam regards Jerusalem as its third-holiest city. Despite having an area of only 0.9 square kilometer (0.35 square mile), the Old City is home to sites of key religious importance, among them the Temple Mount, the Western Wall, the Church of the Holy Sepulchre, the Dome of the Rock and al-Aqsa Mosque. The old walled city, a World Heritage site, has been traditionally divided into four quarters, although the names used today—the Armenian, Christian, Jewish, and Muslim Quarters—were introduced in the early 19th century. The Old City was nominated for inclusion on the List of World Heritage Sites in danger by Jordan in 1982. In the course of its history, Jerusalem has been destroyed twice, besieged 23 times, attacked 52 times, and captured and recaptured 44 times. Today, the status of Jerusalem remains one of the core issues in the Israeli-Palestinian conflict. Israel's annexation of East Jerusalem has been repeatedly criticized by the United Nations and related bodies, and Palestinians demand East Jerusalem as the capital of their future state. In the wake of United Nations Security Council Resolution 478 (passed in 1980), most foreign embassies moved out of Jerusalem, although some countries, such as the United States, still own land in the city and pledge to return their embassies once political agreements warrant the move. The name "Jerusalem" is a compound of two Semitic roots, "s-l-m" meaning wholeness, peace, harmony or completeness, and "y-r-h" meaning to show, direct, instruct, or teach. Jerusalem means "Teaching of Peace", or "Whole or Complete Instruction". A city called Rušalimum or Urušalimum appears in ancient Egyptian records as one of the first references to Jerusalem. These Egyptian forms are thought to derive from the local name attested in the Amarna letters, e.g. : in EA 287 (where it takes several forms) Urusalim. The form Yerushalayim (Jerusalem) first appears in the book of Joshua. This form has the appearance of a portmanteau (blend) of yerusha (heritage) and the original name Shalem and is not a simple phonetic evolution of the form in the Amarna letters. Some believe there is a connection to Shalim, the beneficent deity known from Ugaritic myths as the personification of dusk. Another suggested etymology is Jerū-šālēm, the first part of which possibly means "settlement" or "fortress" (thence "The Abode of Shalim"). Typically the ending -im indicates the plural in Hebrew grammar and -ayim the dual thus leading to the suggestion that the name refers to the fact that the city sits on two hills. However the pronunciation of the last syllable as -ayim appears to be a late development, which had not yet appeared at the time of the Septuagint. In Greek and Latin it is transliterated Hierosolyma (Ιερουσαλήμ). To the Arabs, Jerusalem is al-Quds ("The Holy"). "Zion" initially referred to part of the city, but later came to signify the city as a whole. Under King David, it was known as Ir David (the City of David). Ceramic evidence indicates the occupation of Ophel, within present-day Jerusalem, as far back as the Copper Age, c. 4th millennium BCE, with evidence of a permanent settlement during the early Bronze Age, c. 3000–2800 BCE. The Execration Texts (c. 19th century BCE), which refer to a city called Roshlamem or Rosh-ramen and the Amarna letters (c. 14th century BCE) may be the earliest mention of the city. Some archaeologists, including Kathleen Kenyon, believe Jerusalem as a city was founded by West Semitic people with organized settlements from around 2600 BCE. According to Jewish tradition the city was founded by Shem and Eber, ancestors of Abraham. In the biblical account, when first mentioned, Jerusalem (known as "Salem") is ruled by Melchizedek, an ally of Abraham (identified with Shem in legend). Later, in the time of Joshua, Jerusalem was in territory allocated to the tribe of Benjamin (Joshua 18:28) but it continued to be under the independent control of the Jebusites until it was conquered by David and made into the capital of the united Kingdom of Israel (c. 1000s BCE). [v] Recent excavations of a large stone structure are interpreted by some archaeologists as lending credence to the biblical narrative. According to Hebrew scripture, King David reigned until 970 BCE. He was succeeded by his son Solomon, who built the Holy Temple on Mount Moriah. Solomon's Temple (later known as the First Temple), went on to play a pivotal role in Jewish history as the repository of the Ark of the Covenant. For over 450 years, until the Babylonian conquest in 587 BCE, Jerusalem was the political capital of firstly the united Kingdom of Israel and then the Kingdom of Judah and the Temple was the religious center of the Israelites. This period is known in history as the First Temple Period. Upon Solomon's death (c. 930 BCE), the ten northern tribes split off to form the Kingdom of Israel. Under the leadership of the House of David and Solomon, Jerusalem remained the capital of the Kingdom of Judah. When the Assyrians conquered the Kingdom of Israel in 722 BCE, Jerusalem was strengthened by a great influx of refugees from the northern kingdom. The First Temple period ended around 586 BCE, as the Babylonians conquered Judah and Jerusalem, and laid waste to Solomon's Temple. In 538 BCE, after fifty years of Babylonian captivity, Persian King Cyrus the Great invited the Jews to return to Judah to rebuild the Temple. Construction of the Second Temple was completed in 516 BCE, during the reign of Darius the Great, seventy years after the destruction of the First Temple. Later, in ~445 BCE, King Artaxerxes I of Persia issued a decree allowing the city and the walls to be rebuilt. Jerusalem resumed its role as capital of Judah and center of Jewish worship. When Macedonian ruler Alexander the Great conquered the Persian Empire, Jerusalem and Judea fell under Macedonian control, eventually falling to the Ptolemaic dynasty under Ptolemy I. In 198 BCE, Ptolemy V lost Jerusalem and Judea to the Seleucids under Antiochus III. The Seleucid attempt to recast Jerusalem as a Hellenized polis came to a head in 168 BCE with the successful Maccabean revolt of Mattathias the High Priest and his five sons against Antiochus Epiphanes, and their establishment of the Hasmonean Kingdom in 152 BCE with Jerusalem again as its capital. As Rome became stronger it installed Herod as a Jewish client king. Herod the Great, as he was known, devoted himself to developing and beautifying the city. He built walls, towers and palaces, and expanded the Temple Mount, buttressing the courtyard with blocks of stone weighing up to 100 tons. Under Herod, the area of the Temple Mount doubled in size. In 6 CE, the city, as well as much of the surrounding area, came under direct Roman rule as the Iudaea Province and Herod's descendants through Agrippa II remained client kings of Judea until 96 CE. Roman rule over Jerusalem and the region began to be challenged with the First Jewish–Roman War, which resulted in the destruction of the Second Temple in 70 CE. Jerusalem once again served as the capital of Judea during the three-year rebellion known as the Bar Kokhba revolt, beginning in 132 CE. The Romans succeeded in suppressing the revolt in 135 CE. Emperor Hadrian romanized the city, renaming it Aelia Capitolina., and banned the Jews from entering it. Hadrian renamed the entire Iudaea Province Syria Palaestina after the biblical Philistines in an attempt to de-Judaize the country. Enforcement of the ban on Jews entering Aelia Capitolina continued until the 4th century CE. In the five centuries following the Bar Kokhba revolt, the city remained under Roman then Byzantine rule. During the 4th century, the Roman Emperor Constantine I constructed Christian sites in Jerusalem such as the Church of the Holy Sepulchre. Jerusalem reached a peak in size and population at the end of the Second Temple Period: The city covered two square kilometers (0.8 sq mi.) and had a population of 200,000 From the days of Constantine until the 7th century, Jews were banned from Jerusalem. Within the span of a few decades, Jerusalem shifted from Roman to Persian rule and returned to Roman dominion once more. Following Sassanid Khosrau II's early seventh century push into Byzantine, advancing through Syria, Sassanid Generals Shahrbaraz and Shahin attacked the Byzantine-controlled city of Jerusalem (Persian: Dej Houdkh). They were aided by the Jews of Palestine, who had risen up against the Byzantines. In the Siege of Jerusalem (614), after 21 days of relentless siege warfare, Jerusalem was captured. The Byzantine chronicles relate that the Sassanid army and the Jews slaughtered tens of thousands of Christians in the city, an episode which has been the subject of much debate between historians. The conquered city would remain in Sassanid hands for some fifteen years until the Byzantine Emperor Heraclius reconquered it in 629. Jerusalem is considered Islam's third holiest city after Mecca and Medina. Among Muslims of an earlier era it was referred to as Bayt al-Maqdes; later it became known as al-Quds al-Sharif. In 638 the Islamic Caliphate extended its dominion to Jerusalem. With the Arab conquest, Jews were allowed back into the city. The Rashidun caliph Umar ibn al-Khattab signed a treaty with Monophysite Christian Patriarch Sophronius, assuring him that Jerusalem's Christian holy places and population would be protected under Muslim rule. Umar refused to pray in the church, so that the descendant Muslims would not request converting the church to a mosque. He prayed outside the church, where the Mosque of Umar (Omar) stands till the present time. According to the Gaullic bishop Arculf, who lived in Jerusalem from 679 to 688, the Mosque of Umar was a rectangular wooden structure built over ruins which could accommodate 3,000 worshipers. When the Muslims went to Bayt Al-Maqdes for the first time, They searched for the site of the Far Away Holy Mosque (Al-Masjed Al-Aqsa) that was mentioned in Quran and Hadith according to Islamic beliefs. They found the site full of rubbish, they cleaned it and started using it for prayers thereafter. The Umayyad caliph Abd al-Malik commissioned the construction of the Dome of the Rock in the late 7th century. The 10th century historian al-Muqaddasi writes that Abd al-Malik built the shrine in order to compete in grandeur with Jerusalem's monumental churches. Over the next four hundred years Jerusalem's prominence diminished as Arab powers in the region jockeyed for control. In 1099, The Fatimid ruler expelled the native Christian population before Jerusalem was conquered by the Crusaders, who massacred most of its Muslim and Jewish inhabitants when they took the solidly defended city by assault, after a period of siege; later the Crusaders created the Kingdom of Jerusalem. By early June 1099 Jerusalem's population had declined from 70,000 to less than 30,000. In 1187, the city was wrested from the Crusaders by Saladin who permitted Jews and Muslims to return and settle in the city. Under the Ayyubid dynasty of Saladin, a period of huge investment began in the construction of houses, markets, public bathes, and pilgrim hostels as well as the establishment of religious endowments. However, for most of the 13th century, Jerusalem declined to the status of a village due to city's fall of strategic value and Ayyubid internecine struggles. In 1244, Jerusalem was sacked by the Khwarezmian Tartars, who decimated the city's Christian population and drove out the Jews. The Khwarezmian Tartars were driven out by the Ayyubids in 1247. From 1250 to 1517, Jerusalem was ruled by the Mamluks. During this period of time many clashes occurred between the Mamluks on one side and the crusaders and the Mongols on the other side. The area also suffered from many earthquakes and black plague. In 1517, Jerusalem and environs fell to the Ottoman Turks, who generally remained in control until 1917. Jerusalem enjoyed a prosperous period of renewal and peace under Suleiman the Magnificent – including the rebuilding of magnificent walls around the Old City. Throughout much of Ottoman rule, Jerusalem remained a provincial, if religiously important center, and did not straddle the main trade route between Damascus and Cairo. However, the Muslim Turks brought many innovations: modern postal systems run by the various consulates; the use of the wheel for modes of transportation; stagecoach and carriage, the wheelbarrow and the cart; and the oil-lantern, among the first signs of modernization in the city. In the mid 19th century, the Ottomans constructed the first paved road from Jaffa to Jerusalem, and by 1892 the railroad had reached the city. With the annexation of Jerusalem by Muhammad Ali of Egypt in 1831, foreign missions and consulates began to establish a foothold in the city. In 1836, Ibrahim Pasha allowed Jerusalem's Jewish residents to restore four major synagogues, among them the Hurva. In the 1834 Arab revolt in Palestine, Qasim al-Ahmad led his forces from Nablus and attacked Jerusalem, aided by the Abu Ghosh clan, entered the city on May 31, 1834. The Christians and Jews of Jerusalem were subjected to attacks. Ibrahim's Egyptian army routed Qasim's forces in Jerusalem the following month. Ottoman rule was reinstated in 1840, but many Egyptian Muslims remained in Jerusalem and Jews from Algiers and North Africa began to settle in the city in growing numbers. In the 1840s and 1850s, the international powers began a tug-of-war in Palestine as they sought to extend their protection over the region's religious minorities, a struggle carried out mainly through consular representatives in Jerusalem. According to the Prussian consul, the population in 1845 was 16,410, with 7,120 Jews, 5,000 Muslims, 3,390 Christians, 800 Turkish soldiers and 100 Europeans. The volume of Christian pilgrims increased under the Ottomans, doubling the city's population around Easter time. In the 1860s, new neighborhoods began to develop outside the Old City walls to house pilgrims and relieve the intense overcrowding and poor sanitation inside the city. The Russian Compound and Mishkenot Sha'ananim were founded in 1860. In 1867 an American Missionary reports an estimated population of Jerusalem of 'above' 15,000. With 4,000 to 5,000 Jews and 6,000 Muslims. Every year there were 5,000 to 6,000 Russian Christian Pilgrims. In 1917 after the Battle of Jerusalem, the British Army, led by General Edmund Allenby, captured the city, and in 1922, the League of Nations at the Conference of Lausanne entrusted the United Kingdom to administer the Mandate for Palestine. From 1922 to 1948 the total population of the city rose from 52,000 to 165,000 with two thirds of Jews and one-third of Arabs (Muslims and Christians). The situation between Arabs and Jews in Palestine was not quiet. At Jerusalem, in particular riots occurred in 1920 and in 1929. Under the British, new garden suburbs were built in the western and northern parts of the city and institutions of higher learning such as the Hebrew University were founded. As the British Mandate for Palestine was expiring, the 1947 UN Partition Plan recommended "the creation of a special international regime in the City of Jerusalem, constituting it as a corpus separatum under the administration of the United Nations." The international regime (which also included the city of Bethlehem) was to remain in force for a period of ten years, whereupon a referendum was to be held in which the residents were to decide the future regime of their city. However, this plan was not implemented, as the 1948 war erupted, while the British withdrew from Palestine and Israel declared its independence. The war led to displacement of Arab and Jewish populations in the city. The 1,500 residents of the Jewish Quarter of the Old City were expelled and a few hundred taken prisoner when the Arab Legion captured the quarter on 28 May. The Arab Legion also attacked Western Jerusalem with snipers. 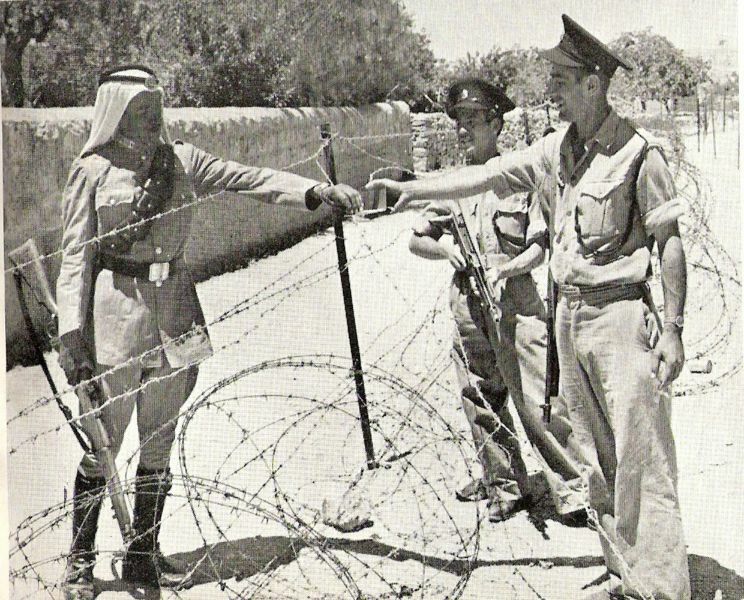 The no-man's land between East and West Jerusalem came into being in November 1948: Moshe Dayan, commander of the Israeli forces in Jerusalem, met with his Jordanian counterpart Abdullah el Tell in a deserted house in Jerusalem's Musrara neighborhood and marked out their respective positions: Israel's position in red and Jordan's in green. This rough map, which was not meant as an official one, became the final ceasefire line in the 1949 Armistice Agreements, which divided the city and left Mount Scopus as an Israeli exclave. Barbed wire and concrete barriers ran down the center of the city and military skirmishes frequently threatened the ceasefire. After the establishment of the State of Israel, Jerusalem was declared its capital. Jordan formally annexed East Jerusalem in 1950, subjecting it to Jordanian law. Only the United Kingdom and Pakistan formally recognized such annexation, which, in regard to Jerusalem, was on a de facto basis. Also, it is dubious if Pakistan recognized Jordan's annexation. Jordan assumed control of the holy places in the Old City. Contrary to the terms of the agreement, Israelis were denied access to Jewish holy sites, many of which were desecrated. Jordan allowed only very limited access to Christian holy sites. During this period, the Dome of the Rock and al-Aqsa Mosque underwent major renovations. After Israel captured East Jerusalem in the 1967 Six-Day War, Jewish and Christian access to holy sites was restored, while the Temple Mount remained under the jurisdiction of an Islamic waqf. The Moroccan Quarter, which was located adjacent to the Western Wall, was vacated and razed to make way for a plaza for those visiting the wall. Since the war, Israel has expanded the city's boundaries and established a ring of Jewish neighbourhoods on land east of the Green Line. However, the takeover of East Jerusalem was met with international criticism. Following the passing of Israel's Jerusalem Law, which declared Jerusalem, "complete and united", the capital of Israel, the United Nations Security Council passed a resolution that declared the law "a violation of international law" and requested all member states to withdraw all remaining embassies from the city. The status of the city, and especially its holy places, remains a core issue in the Israeli-Palestinian conflict. The Israeli government has approved building plans in the Muslim Quarter of the Old City in order to expand the Jewish presence in East Jerusalem, while prominent Islamic leaders have made claims that Jews have no historical connection to Jerusalem, alleging that the 2,500-year old Western Wall was constructed as part of a mosque. Palestinians envision East Jerusalem as the capital of a future Palestinian state, and the city's borders have been the subject of bilateral talks. A strong longing for peace is symbolized by the Peace Monument (with farming tools made out of scrap weapons), facing the Old City wall near the former Israeli-Jordanian border and quoting from the book of Isaiah in Arabic and Hebrew. Jerusalem is situated on the southern spur of a plateau in the Judean Mountains, which include the Mount of Olives (East) and Mount Scopus (North East). The elevation of the Old City is approximately 760 m (2,500 ft). The whole of Jerusalem is surrounded by valleys and dry riverbeds (wadis). The Kidron, Hinnom, and Tyropoeon Valleys intersect in an area just south of the Old City of Jerusalem. The Kidron Valley runs to the east of the Old City and separates the Mount of Olives from the city proper. 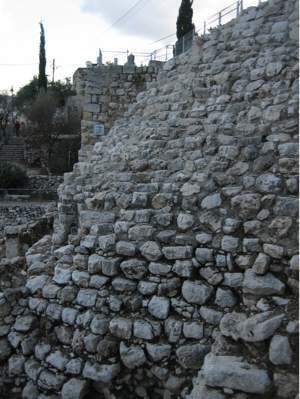 Along the southern side of old Jerusalem is the Valley of Hinnom, a steep ravine associated in biblical eschatology with the concept of Gehenna or Hell. The Tyropoeon Valley commenced in the northwest near the Damascus Gate, ran south-southeasterly through the center of the Old City down to the Pool of Siloam, and divided the lower part into two hills, the Temple Mount to the east, and the rest of the city to the west (the lower and the upper cities described by Josephus). Today, this valley is hidden by debris that has accumulated over the centuries. Jerusalem is 60 kilometers (37 mi) east of Tel Aviv and the Mediterranean Sea. On the opposite side of the city, approximately 35 kilometers (22 mi) away, is the Dead Sea, the lowest body of water on Earth. Neighboring cities and towns include Bethlehem and Beit Jala to the south, Abu Dis and Ma'ale Adumim to the east, Mevaseret Zion to the west, and Ramallah and Giv'at Ze'ev to the north. The city is characterized by a Mediterranean climate, with hot, dry summers, and cold, wet winters. Snow usually occurs once or twice a winter, although the city experiences heavy snowfall every three to four years on average. January is the coldest month of the year, with an average temperature of 8 °C (46 °F); July and August are the hottest months, with an average temperature of 23 °C (73 °F). Temperatures vary widely from day to night, and Jerusalem evenings are typically cool even in summer. The average annual precipitation is close to 590 millimetres (23 in) with rain occurring mostly between October and May. In December 2007, Jerusalem had a population of 747,600—64% were Jewish, 32% Muslim, and 2% Christian. At the end of 2005, the population density was Template:Pop density km2 to mi2. According to a study published in 2000, the percentage of Jews in the city's population had been decreasing; this was attributed to a higher Muslim birth rate, and Jewish residents leaving. The study also found that about nine percent of the Old City's 32,488 people were Jews. In 2005, 2,850 new immigrants settled in Jerusalem, mostly from the United States, France and the former Soviet Union. In terms of the local population, the number of outgoing residents exceeds the number of incoming residents. In 2005, 16,000 left Jerusalem and only 10,000 moved in. Nevertheless, the population of Jerusalem continues to rise due to the high birth rate, especially in the Arab and Haredi Jewish communities. Consequently, the total fertility rate in Jerusalem (4.02) is higher than in Tel Aviv (1.98) and well above the national average of 2.90. The average size of Jerusalem's 180,000 households is 3.8 people. In 2005, the total population grew by 13,000 (1.8%)—similar to Israeli national average, but the religious and ethnic composition is shifting. While 31% of the Jewish population is made up of children below the age fifteen, the figure for the Arab population is 42%. This would seem to corroborate the observation that the percentage of Jews in Jerusalem has declined over the past four decades. In 1967, Jews accounted for 74 percent of the population, while the figure for 2006 is down nine percent. Possible factors are the high cost of housing, fewer job opportunities and the increasingly religious character of the city, although proportionally, young haredim are leaving in higher numbers. Many people are moving to the suburbs and coastal cities in search of cheaper housing and a more secular lifestyle. While many Israelis see Jerusalem as poor, rundown and riddled with religious and political tension, the city has been a magnet for Palestinians, offering more jobs and opportunity than any city in the West Bank or Gaza Strip. Palestinian officials have encouraged Arabs over the years to stay in the city to maintain their claim. Palestinians are attracted to the access to jobs, healthcare, social security, other benefits, and quality of life Israel provides to Jerusalem residents. Arab residents of Jerusalem who choose not to have Israeli citizenship are granted an Israeli identity card that allows them to pass through checkpoints with relative ease and to travel throughout Israel, making it easier to find work. Residents also are entitled to the subsidized healthcare and social security benefits Israel provides its citizens. Arabs in Jerusalem can send their children to Israeli-run schools, although not every neighborhood has one, and universities. Israeli doctors and highly regarded hospitals such as Hadassah Medical Center are available to residents. Demographics and the Jewish-Arab population divide play a major role in the dispute over Jerusalem. In 1998, the Jerusalem Development Authority proposed expanding city limits to the west to include more areas heavily populated with Jews. Critics of efforts to promote a Jewish majority in Israel say that government planning policies are motivated by demographic considerations and seek to limit Arab construction while promoting Jewish construction. According to a World Bank report, the number of recorded building violations between 1996 and 2000 was four and half times higher in Jewish neighborhoods but four times fewer demolition orders were issued in West Jerusalem than in East Jerusalem; Palestinians in Jerusalem were less likely to receive construction permits than Jews, and "the authorities are much more likely to take action against Palestinian violators" than Jewish violators of the permit process. In recent years, private Jewish foundations have received permission from the government to develop projects on disputed lands, such as the City of David archaeological park in the Palestinian neighborhood of Silwan (adjacent to the Old City), and the Museum of Tolerance on Mamilla cemetery (adjacent to Zion Square). The Israeli government has also expropriated Palestinian land for the construction of the Israeli West Bank barrier. Opponents view such urban planning moves as geared towards the Judaization of Jerusalem. The Jerusalem City Council is a body of 31 elected members headed by the mayor, who serves a five-year term and appoints six deputies. The former mayor of Jerusalem, Uri Lupolianski, was elected in 2003. In the November 2008 city elections, Nir Barkat came out as the winner and is now the mayor. Apart from the mayor and his deputies, City Council members receive no salaries and work on a voluntary basis. The longest-serving Jerusalem mayor was Teddy Kollek, who spent twenty-eight years—six consecutive terms—in office. Most of the meetings of the Jerusalem City Council are private, but each month, it holds a session that is open to the public. Within the city council, religious political parties form an especially powerful faction, accounting for the majority of its seats. The headquarters of the Jerusalem Municipality and the mayor's office are at Safra Square (Kikar Safra) on Jaffa Road. The new municipal complex, comprising two modern buildings and ten renovated historic buildings surrounding a large plaza, opened in 1993. The city falls under the Jerusalem District, with Jerusalem as the district's capital. On December 5, 1949, the State of Israel's first Prime Minister, David Ben-Gurion, proclaimed Jerusalem as Israel's capital and since then all branches of the Israeli government—legislative, judicial, and executive—have resided there, except for the Ministry of Defense, located at HaKirya in Tel Aviv. At the time of the proclamation, Jerusalem was divided between Israel and Jordan and thus only West Jerusalem was considered Israel's capital. Immediately after the 1967 Six-Day War, however, Israel annexed East Jerusalem, making it a de facto part of the Israeli capital. Israel enshrined the status of the "complete and united" Jerusalem—west and east—as its capital, in the 1980 Basic Law: Jerusalem, Capital of Israel. The status of a "united Jerusalem" as Israel's "eternal capital" has been a matter of immense controversy within the international community. Although some countries maintain consulates in Jerusalem, all embassies are located outside of the city proper, mostly in Tel Aviv. The non-binding United Nations Security Council Resolution 478, passed on August 20, 1980, declared that the Basic Law was "null and void and must be rescinded forthwith." Member states were advised to withdraw their diplomatic representation from the city as a punitive measure. Most of the remaining countries with embassies in Jerusalem complied with the resolution by relocating them to Tel Aviv, where many embassies already resided prior to Resolution 478. Currently there are no embassies located within the city limits of Jerusalem, although there are embassies in Mevaseret Zion, on the outskirts of Jerusalem, and four consulates in the city itself. In 1995, the United States Congress had planned to move its embassy from Tel Aviv to Jerusalem with the passage of the Jerusalem Embassy Act. However, former U.S. President George W. Bush has argued that Congressional resolutions regarding the status of Jerusalem are merely advisory. The Constitution reserves foreign relations as an executive power, and as such, the United States embassy is still in Tel Aviv. Israel's most prominent governmental institutions, including the Knesset, the Supreme Court, and the official residences of the President and Prime Minister, are located in Jerusalem. Prior to the creation of the State of Israel, Jerusalem served as the administrative capital of the British Mandate, which included present-day Israel and Jordan. From 1949 until 1967, West Jerusalem served as Israel's capital, but was not recognized as such internationally because UN General Assembly Resolution 194 envisaged Jerusalem as an international city. As a result of the Six-Day War in 1967, the whole of Jerusalem came under Israeli control. On June 27, 1967, the government of Levi Eshkol extended Israeli law and jurisdiction to East Jerusalem, but agreed that administration of the Temple Mount compound would be maintained by the Jordanian waqf, under the Jordanian Ministry of Religious Endowments. In 1988, Israel ordered the closure of Orient House, home of the Arab Studies Society, but also the headquarters of the Palestine Liberation Organization, for security reasons. The building reopened in 1992 as a Palestinian guesthouse. The Oslo Accords stated that the final status of Jerusalem would be determined by negotiations with the Palestinian National Authority, which regards East Jerusalem as the capital of a future Palestinian state. Jerusalem plays an important role in Judaism, Christianity, and Islam. The 2000 Statistical Yearbook of Jerusalem lists 1204 synagogues, 158 churches, and 73 mosques within the city. Despite efforts to maintain peaceful religious coexistence, some sites, such as the Temple Mount, have been a continuous source of friction and controversy. Jerusalem has been sacred to the Jews since King David proclaimed it his capital in the 10th century BCE. Jerusalem was the site of Solomon's Temple and the Second Temple. It is mentioned in the Bible 632 times. Today, the Western Wall, a remnant of the wall surrounding the Second Temple, is a Jewish holy site second only to the Holy of Holies on the Temple Mount itself. Synagogues around the world are traditionally built with the Holy Ark facing Jerusalem, and Arks within Jerusalem face the "Holy of Holies". As prescribed in the Mishna and codified in the Shulchan Aruch, daily prayers are recited while facing towards Jerusalem and the Temple Mount. Many Jews have "Mizrach" plaques hung on a wall of their homes to indicate the direction of prayer. Christianity reveres Jerusalem not only for its Old Testament history but also for its significance in the life of Jesus. According to the New Testament, Jesus was brought to Jerusalem soon after his birth and later in his life cleansed the Second Temple. The Cenacle, believed to be the site of Jesus' Last Supper, is located on Mount Zion in the same building that houses the Tomb of King David. Another prominent Christian site in Jerusalem is Golgotha, the site of the crucifixion. The Gospel of John describes it as being located outside Jerusalem, but recent archaeological evidence suggests Golgotha is a short distance from the Old City walls, within the present-day confines of the city. The land currently occupied by the Church of the Holy Sepulchre is considered one of the top candidates for Golgotha and thus has been a Christian pilgrimage site for the past two thousand years. Jerusalem is considered the third-holiest city in Islam. For approximately a year, before it was permanently switched to the Kabaa in Mecca, the qibla (direction of prayer) for Muslims was Jerusalem. The city's lasting place in Islam, however, is primarily due to Muhammad's Night of Ascension (c. 620 CE). Muslims believe Muhammad was miraculously transported one night from Mecca to the Temple Mount in Jerusalem, whereupon he ascended to Heaven to meet previous prophets of Islam. The first verse in the Qur'an's Surat al-Isra notes the destination of Muhammad's journey as al-Aqsa (the farthest) mosque, in reference to the location in Jerusalem. Today, the Temple Mount is topped by two Islamic landmarks intended to commemorate the event—al-Aqsa Mosque, derived from the name mentioned in the Qur'an, and the Dome of the Rock, which stands over the Foundation Stone, from which Muslims believe Muhammad ascended to Heaven. Although Jerusalem is known primarily for its religious significance, the city is also home to many artistic and cultural venues. The Israel Museum attracts nearly one million visitors a year, approximately one-third of them tourists. The 20 acre museum complex comprises several buildings featuring special exhibits and extensive collections of Judaica, archaeological findings, and Israeli and European art. The Dead Sea scrolls, discovered in the mid-twentieth century in the Qumran caves near the Dead Sea, are housed in the Museum's Shrine of the Book. The Youth Wing, which mounts changing exhibits and runs an extensive art education program, is visited by 100,000 children a year. The museum has a large outdoor sculpture garden, and a scale-model of the Second Temple was recently moved from the Holyland Hotel to a new location on the museum grounds. The Rockefeller Museum, located in East Jerusalem, was the first archaeological museum in the Middle East. It was built in 1938 during the British Mandate. Yad Vashem, Israel's national memorial to the victims of the Holocaust, houses the world's largest library of Holocaust-related information, with an estimated 100,000 books and articles. The complex contains a state-of-the-art museum that explores the genocide of the Jews through exhibits that focus on the personal stories of individuals and families killed in the Holocaust and an art gallery featuring the work of artists who perished. Yad Vashem also commemorates the 1.5 million Jewish children murdered by the Nazis, and honors the Righteous among the Nations. The Museum on the Seam, which explores issues of coexistence through art is situated on the road dividing eastern and western Jerusalem. The Jerusalem Symphony Orchestra, established in the 1940s, has appeared around the world. Other arts facilities include the International Convention Center (Binyanei HaUma) near the entrance to city, where the Israel Philharmonic Orchestra plays, the Jerusalem Cinemateque, the Gerard Behar Center (formerly Beit Ha'am) in downtown Jerusalem, the Jerusalem Music Center in Yemin Moshe, and the Targ Music Center in Ein Kerem. The Israel Festival, featuring indoor and outdoor performances by local and international singers, concerts, plays and street theater, has been held annually since 1961; for the past 25 years, Jerusalem has been the major organizer of this event. The Jerusalem Theater in the Talbiya neighborhood hosts over 150 concerts a year, as well as theater and dance companies and performing artists from overseas. The Khan Theater, located in a caravansarai opposite the old Jerusalem train station, is the city's only repertoire theater. The station itself has become a venue for cultural events in recent years, as the site of Shav'ua Hasefer, an annual week-long book fair, and outdoor music performances. The Jerusalem Film Festival is held annually, screening Israeli and international films. The Ticho House, in downtown Jerusalem, houses the paintings of Anna Ticho and the Judaica collections of her husband, an ophthalmologist who opened Jerusalem's first eye clinic in this building in 1912. Al-Hoash, established in 2004, is a gallery for the preservation of Palestinian art. Besides being a center for Jewish Israeli culture, Jerusalem is a capital of Palestinian culture. Jerusalem was selected by UNESCO as the 2009 Capital of Arab Culture. Jerusalem is home to the Palestinian National Theatre, which engages in cultural preservation as well as innovation, working to upgrade and rekindle interest in the arts at the national level. The The Edward Said National Conservatory of Music is headquartered in Jerusalem. The conservatory sponsors the Palestine Youth Orchestra, which has achieved acclaim throughout the Arab world – in 2009, the orchestra, which includes Palestinian musicians from Jerusalem, the West Bank and the Gaza Strip, Israel, and Palestinians living in the Palestinian diaspora – toured the Gulf states and other Middle East countries. The Islamic Museum on the Temple Mount, established in 1923, houses many Islamic artifacts, from tiny kohl flasks and rare manuscripts to giant marble columns. Jerusalem is also a center for Israeli-Palestinian cultural cooperation. Several organizations, including the Abraham Fund and the Jerusalem Intercultural Center (JICC) actively promote joint Jewish-Palestinian cultural projects. The Jerusalem Center for Middle Eastern Music and Dance offers courses and performances by Arab and Jewish students and artists. The JICC offers workshops on Jewish-Arab dialogue through the arts. The Jewish-Arab Youth Orchestra meets in Jerusalem, and performs both European classical and Middle Eastern music. A Tolerance Monument sculpted by Czesław Dźwigaj in collaboration with Michal Kubiak is situated on a hill marking the divide between Jewish Armon Hanatziv and Arab Jebl Mukaber, standing opposite the United Nations headquarters in Jerusalem in a park near Goldman Promenade. Unveiled in Jerusalem in 2008, it was funded by Polish businessman Aleksander Gudzowaty as a symbol to promote peace in the Israeli-Palestinian conflict. Historically, Jerusalem's economy was supported almost exclusively by religious pilgrims, as it was located far from the major ports of Jaffa and Gaza. Jerusalem's religious landmarks today remain the top draw for foreign visitors, with the majority of tourists visiting the Western Wall and the Old City, but in the past half-century it has become increasingly clear that Jerusalem's providence cannot solely be sustained by its religious significance. Although many statistics indicate economic growth in the city, since 1967 East Jerusalem has lagged behind the development of West Jerusalem. Nevertheless, the percentage of households with employed persons is higher for Arab households (76.1%) than for Jewish households (66.8%). The unemployment rate in Jerusalem (8.3%) is slightly better than the national average (9.0%), although the civilian labor force accounted for less than half of all persons fifteen years or older—lower in comparison to that of Tel Aviv (58.0%) and Haifa (52.4%). Poverty in the city has increased dramatically in recent years; between 2001 and 2007, the number of people below the poverty threshold increased by forty percent. In 2006, the average monthly income for a worker in Jerusalem was NIS5,940 (US$1,410), NIS1,350 less than that for a worker in Tel Aviv. During the British Mandate, a law was passed requiring all buildings to be constructed of Jerusalem stone in order to preserve the unique historic and aesthetic character of the city. Complementing this building code, which is still in force, is the discouragement of heavy industry in Jerusalem; only about 2.2% of Jerusalem's land is zoned for "industry and infrastructure." By comparison, the percentage of land in Tel Aviv zoned for industry and infrastructure is twice as high, and in Haifa, seven times as high. Only 8.5% of the Jerusalem District work force is employed in the manufacturing sector, which is half the national average (15.8%). Higher than average percentages are employed in education (17.9% vs. 12.7%); health and welfare (12.6% vs. 10.7%); community and social services (6.4% vs. 4.7%); hotels and restaurants (6.1% vs. 4.7%); and public administration (8.2% vs. 4.7%). Although Tel Aviv remains Israel's financial center, a growing number of high tech companies are moving to Jerusalem, providing 12,000 jobs in 2006. Northern Jerusalem's Har Hotzvim industrial park is home to some of Israel's major corporations, among them Intel, Teva Pharmaceutical Industries, Ophir Optronics and ECI Telecom. Expansion plans for the park envision one hundred businesses, a fire station, and a school, covering an area of 530,000 m² (130 acres). Since the establishment of the State of Israel, the national government has remained a major player in Jerusalem's economy. The government, centered in Jerusalem, generates a large number of jobs, and offers subsidies and incentives for new business initiatives and start-ups. The airport nearest to Jerusalem is Atarot Airport, which was used for domestic flights until its closure in 2001. Since then it has been under the control of the Israel Defense Forces due to disturbances in Ramallah and the West Bank. All air traffic from Atarot was rerouted to Ben Gurion International Airport, Israel's largest and busiest airport, which serves nine million passengers annually. Egged Bus Cooperative, the second-largest bus company in the world, handles most of the local and intercity bus service out of the city's Central Bus Station on Jaffa Road near the western entrance to Jerusalem from highway 1. As of 2008, Egged buses, taxicabs and private cars are the only transportation options in Jerusalem. This is expected to change with the completion of the Jerusalem Light Rail, a new rail-based transit system currently under construction. According to plans, the first rail line will be capable of transporting an estimated 200,000 people daily, and will have 24 stops. It is scheduled for completion in 2010. Another work in progress is a new high-speed rail line from Tel Aviv to Jerusalem, which is scheduled to be completed in 2011. Its terminus will be an underground station (80 m deep) serving the International Convention Center and the Central Bus Station, and is planned to be extended eventually to Malha station. Israel Railways operates train services to Malha train station from Tel Aviv via Beit Shemesh. Begin Expressway is one of Jerusalem's major north-south thoroughfares; it runs on the western side of the city, merging in the north with Route 443, which continues toward Tel Aviv. Route 60 runs through the center of the city near the Green Line between East and West Jerusalem. Construction is progressing on parts of a 35-kilometer (22-mile) ring road around the city, fostering faster connection between the suburbs. The eastern half of the project was conceptualized decades ago, but reaction to the proposed highway is still mixed. Jerusalem is home to several prestigious universities offering courses in Hebrew, Arabic and English. Founded in 1925, the Hebrew University of Jerusalem has been ranked among the top 100 schools in the world. The Board of Governors has included such prominent Jewish intellectuals as Albert Einstein and Sigmund Freud. The university has produced several Nobel laureates; recent winners associated with Hebrew University include Avram Hershko, David Gross, and Daniel Kahneman. One of the university's major assets is the Jewish National and University Library, which houses over five million books. The library opened in 1892, over three decades before the university was established, and is one of the world's largest repositories of books on Jewish subjects. Today it is both the central library of the university and the national library of Israel. The Hebrew University operates three campuses in Jerusalem, on Mount Scopus, on Giv'at Ram and a medical campus at the Hadassah Ein Kerem hospital. Al-Quds University was established in 1984 to serve as a flagship university for the Arab and Palestinian peoples. It describes itself as the "only Arab university in Jerusalem". Al-Quds University resides southeast of the city proper on a campus encompassing 190,000 square metres (47 acres). Other institutions of higher learning in Jerusalem are the Jerusalem Academy of Music and Dance and Bezalel Academy of Art and Design, whose buildings are located on the campuses of the Hebrew University. The Jerusalem College of Technology, founded in 1969, combines training in engineering and other high-tech industries with a Jewish studies program. It is one of many schools in Jerusalem, from elementary school and up, that combine secular and religious studies. Numerous religious educational institutions and Yeshivot, including some of the most prestigious yeshivas, among them the Brisk, Chevron and Mir, are based in the city, with the Mir Yeshiva claiming to be the largest. There were nearly 8,000 twelfth-grade students in Hebrew-language schools during the 2003–2004 school year. However, due to the large portion of students in Haredi Jewish frameworks, only fifty-five percent of twelfth graders took matriculation exams (Bagrut) and only thirty-seven percent were eligible to graduate. Unlike public schools, many Haredi schools do not prepare students to take standardized tests. To attract more university students to Jerusalem, the city has begun to offer a special package of financial incentives and housing subsidies to students who rent apartments in downtown Jerusalem. Schools for Arabs in Jerusalem and other parts of Israel have been criticized for offering a lower quality education than those catering to Israeli Jewish students. While many schools in the heavily Arab East Jerusalem are filled to capacity and there have been complaints of overcrowding, the Jerusalem Municipality is currently building over a dozen new schools in the city's Arab neighborhoods. Schools in Ras el-Amud and Umm Lison opened in 2008. In March 2007, the Israeli government approved a 5-year plan to build 8,000 new classrooms in the city, 40 percent in the Arab sector and 28 percent in the Haredi sector. A budget of 4.6 billion shekels was allocated for this project. In 2008, Jewish British philanthropists donated $3 million for the construction of schools in Arab East Jerusalem. Arab high school students take the Bagrut matriculation exams, so that much of their curriculum parallels that of other Israeli high schools and includes certain Jewish subjects. The two most popular sports are football and basketball. Beitar Jerusalem Football Club is one of the most well known in Israel. Fans include political figures who often attend its games. Jerusalem's other major football team, and one of Beitar's top rivals, is Hapoel Jerusalem F.C. Whereas Beitar has been Israel State Cup champion seven times, Hapoel has only won the Cup once. Beitar has won the top league six times, while Hapoel never succeeded. Beitar plays in the more prestigious Ligat HaAl, while Hapoel is in the seconed division Liga Leumit. In basketball, Hapoel Jerusalem plays in the top division. The club has won the State Cup three times, and the ULEB Cup in 2004. Since its opening in 1992, Teddy Kollek Stadium has been Jerusalem's primary football stadium, with a capacity of 21,600. The Jerusalem Half Marathon is an annual event in which runners from all over the world compete on a course that takes in some of the city's most famous sights. In addition to the 21.1 km (13.1 miles) Half Marathon, runners can also opt for the shorter 10 km (6.2 miles) Fun Run. Both runs start and finish at the stadium in Givat Ram. Some or all of this article is forked from Wikipedia. The original article was at Jerusalem. The list of authors can be seen in the page history. ↑ 1.0 1.1 1.2 "TABLE 3. - POPULATION(1) OF LOCALITIES NUMBERING ABOVE 2,000 RESIDENTS AND OTHER RURAL POPULATION ON 31/12/2008" (PDF). Israel Central Bureau of Statistics. 2008-12-31. http://www.cbs.gov.il/population/new_2009/table3.pdf. Retrieved 2009-10-26. ↑ 3.0 3.1 3.2 3.3 3.4 3.5 3.6 3.7 3.8 3.9 "Press Release: Jerusalem Day" (PDF). Central Bureau of Statistics. 2006-05-24. http://www.cbs.gov.il/hodaot2006n/11_06_106e.pdf. Retrieved 2007-03-10. ↑ "Local Authorities in Israel 2007, Publication #1295 - Municipality Profiles - Jerusalem" (in Hebrew) (PDF). Israel Central Bureau of Statistics. http://www.cbs.gov.il/population/new_2009/table3.pdf. Retrieved 2007-12-31. ↑ 5.0 5.1 "Timeline for the History of Jerusalem". Jewish Virtual Library. American-Israeli Cooperative Enterprise. http://www.jewishvirtuallibrary.org/jsource/Peace/jerutime.html. Retrieved 2007-04-16. "The Jewish people are inextricably bound to the city of Jerusalem. No other city has played such a dominant role in the history, politics, culture, religion, national life and consciousness of a people as has Jerusalem in the life of Jewry and Judaism. Since King David established the city as the capital of the Jewish state circa 1000 BCE, it has served as the symbol and most profound expression of the Jewish people's identity as a nation." Basic Facts you should know: Jerusalem, Anti-Defamation League, 2007. Retrieved March 28, 2007. Esposito, John L. (2002-11-02). What Everyone Needs to Know about Islam. Oxford University Press. p. 157. ISBN 0195157133. "The Night Journey made Jerusalem the third holiest city in Islam"
Brown, Leon Carl (2000-09-15). "Setting the Stage: Islam and Muslims". Religion and State: The Muslim Approach to Politics. Columbia University Press. p. 11. ISBN 0231120389. "The third holiest city of Islam—Jerusalem—is also very much in the center..."
Hoppe, Leslie J. (August 2000). The Holy City: Jerusalem in the Theology of the Old Testament. Michael Glazier Books. p. 14. ISBN 0814650813. "Jerusalem has always enjoyed a prominent place in Islam. Jerusalem is often referred to as the third holiest city in Islam..."
↑ Kollek, Teddy (1977). "Afterword". in John Phillips. A Will to Survive – Israel: the Faces of the Terror 1948-the Faces of Hope Today. Dial Press/James Wade. "about 225 acres (0.91 km2)"
↑ Ben-Arieh, Yehoshua (1984). Jerusalem in the 19th Century, The Old City. Yad Izhak Ben Zvi & St. Martin's Press. p. 14. ISBN 0312441878. ↑ "Do We Divide the Holiest Holy City?". Moment Magazine. http://www.momentmag.com/Exclusive/2008/2008-03/200803-Jerusalem.html. Retrieved 2008-03-05. . According to Eric H. Cline’s tally in Jerusalem Besieged. ↑ "United Nations Security Council Resolution 252". Jewish Virtual Library. 1968-05-21. http://www.jewishvirtuallibrary.org/jsource/UN/unres252.html. Retrieved 2007-05-23. ↑ Resolution 298 of 25 September 1971: "Recalling its resolutions [...] concerning measures and actions by Israel designed to change the status of the Israeli-occupied section of Jerusalem, [...]"
↑ 14.0 14.1 Segal, Jerome M. (Fall 1997). "Negotiating Jerusalem". The University of Maryland School of Public Policy. http://www.publicpolicy.umd.edu/IPPP/Fall97Report/negotiating_jerusalem.htm. Retrieved 2007-02-25. ↑ Møller, Bjørn (November 2002) (PDF). A Cooperative Structure for Israeli-Palestinian Relations. Working Paper No. 1. Centre for European Policy Studies. http://shop.ceps.be/downfree.php?item_id=171. Retrieved 2007-04-16. ↑ Haberman, Clyde (1995-05-11). "Muslims Say They Own Site Proposed for a U.S. Embassy in Jerusalem - The". New York Times. http://query.nytimes.com/gst/fullpage.html?res=990CE6DC103BF932A25756C0A963958260. Retrieved 2009-05-05. ↑ [Jerusalem's Holiest Places], (2006), James Barrat, (English/Spanish) National Geographic,. ↑ Elon, Amos (1996-01-08). Jerusalem. HarperCollins Publishers Ltd. ISBN 0006375316. http://www.usna.edu/Users/history/tucker/hh362/telavivandjerusalem.htm. Retrieved 2007-04-26. "The epithet may have originated in the ancient name of Jerusalem—Salem (after the pagan deity of the city), which is etymologically connected in the Semitic languages with the words for peace (shalom in Hebrew, salam in Arabic)." ↑ Wallace, Edwin Sherman (August 1977). Jerusalem the Holy. New York: Arno Press. p. 16. ISBN 0405102984. "A similar view was held by those who give the Hebrew dual to the word"
↑ "Jerusalem". Jafi.org.il. http://www.jafi.org.il/education/100/places/jer.html. Retrieved 2009-05-05. ↑ 26.0 26.1 26.2 Freedman, David Noel (2000-01-01). Eerdmans Dictionary of the Bible. Wm B. Eerdmans Publishing. pp. 694–695. ISBN 0802824005. ↑ Vaughn, Andrew G.[dead link]; Ann E. Killebrew (2003-08-01). "Jerusalem at the Time of the United Monarchy". Jerusalem in Bible and Archaeology: the First Temple Period. Atlanta: Society of Biblical Literature. pp. 32–33. ISBN 1589830660. ↑ Shalem, Yisrael (1997-03-03). "History of Jerusalem from Its Beginning to David". Jerusalem: Life Throughout the Ages in a Holy City. Bar-Ilan University Ingeborg Rennert Center for Jerusalem Studies. http://www.biu.ac.il/JS/rennert/history_2.html. Retrieved 2007-01-18. ↑ Greenfeld, Howard (2005-03-29). A Promise Fulfilled: Theodor Herzl, Chaim Weizmann, David Ben-Gurion, and the Creation of the State of Israel. Greenwillow. p. 32. ISBN 006051504X. ↑ "Timeline". City of David. Ir David Foundation. http://www.cityofdavid.org.il/timeline_eng.asp. Retrieved 2007-01-18. ↑ Erlanger, Steven (2005-08-05). "King David's Palace Is Found, Archaeologist Says". The New York Times. http://www.nytimes.com/2005/08/05/international/middleeast/05jerusalem.html?ex=1280894400&en=3c435bc7bd0cd531&ei=5088. Retrieved 2007-05-24. ↑ 34.0 34.1 Michael, E.; Sharon O. Rusten, Philip Comfort, and Walter A. Elwell (2005-02-28). The Complete Book of When and Where: In The Bible And Throughout History. Tyndale House Publishers, Inc.. pp. 20–1, 67. ISBN 0842355081. ↑ Merling, David (1993-08-26). "Where is the Ark of the Covenant?". Andrew's University. http://www.andrews.edu/ARCHAEOLOGY/archive/merling/newpage3.htm. Retrieved 2007-01-22. ↑ 37.0 37.1 Zank, Michael. "Capital of Judah I (930–722)". Boston University. http://www.bu.edu/mzank/Jerusalem/p/period2-2-1.htm. Retrieved 2007-01-22. ↑ Zank, Michael. "Capital of Judah (930–586)". Boston University. http://www.bu.edu/mzank/Jerusalem/p/period2-2.htm. Retrieved 2007-01-22. ↑ Sicker, Martin (2001-01-30). Between Rome and Jerusalem: 300 Years of Roman-Judaean Relations. Praeger Publishers. p. 2. ISBN 0275971406. ↑ Zank, Michael. "Center of the Persian Satrapy of Judah (539–323)". Boston University. http://www.bu.edu/mzank/Jerusalem/p/period2-3.htm. Retrieved 2007-01-22. ↑ Schiffman, Lawrence H. (1991). From Text to Tradition: A History of Second Temple and Rabbinic Judaism. Ktav Publishing House. pp. 60–79. ISBN 0-88125-371-5. ↑ Har-el, Menashe. This Is Jerusalem. Canaan Publishing House. pp. 68–95. ↑ Zank, Michael. "The Temple Mount". Boston University. http://www.bu.edu/mzank/Michael_Zank/Jerusalem/templemount.html. Retrieved 2007-01-22. ↑ Crossan, John Dominic (1993-02-26). The Historical Jesus: the life of a Mediterranean Jewish peasant (Reprinted ed.). San Francisco: HarperCollins. p. 92. ISBN 0060616296. "from 4 BCE until 6 CE, when Rome, after exiling [Herod Archelaus] to Gaul, assumed direct prefectural control of his territories"
↑ Lehmann, Clayton Miles. "Palestine: People and Places". The On-line Encyclopedia of the Roman Provinces. The University of South Dakota. Archived from the original on 2008-03-10. http://web.archive.org/web/20080310053409/http://www.usd.edu/erp/Palestine/people&p.htm. Retrieved 2007-04-18. ↑ 48.0 48.1 Lehmann, Clayton Miles (2007-02-22). "Palestine: History". The On-line Encyclopedia of the Roman Provinces. The University of South Dakota. Archived from the original on 2008-03-10. http://web.archive.org/web/20080310053428/http://www.usd.edu/erp/Palestine/history.htm. Retrieved 2007-04-18. ↑ Zank, Michael. "Byzantian Jerusalem". Boston University. http://www.bu.edu/mzank/Jerusalem/p/period3-2.htm. Retrieved 2007-02-01. ↑ 52.0 52.1 Conybeare, Frederick C. (1910). The Capture of Jerusalem by the Persians in 614 AD. English Historical Review 25. pp. 502–517. ↑ Gil, Moshe (February 1997). A History of Palestine, 634-1099. Cambridge University Press. pp. 70–71. ISBN 0521599849. ↑ Runciman, Steven (1951). 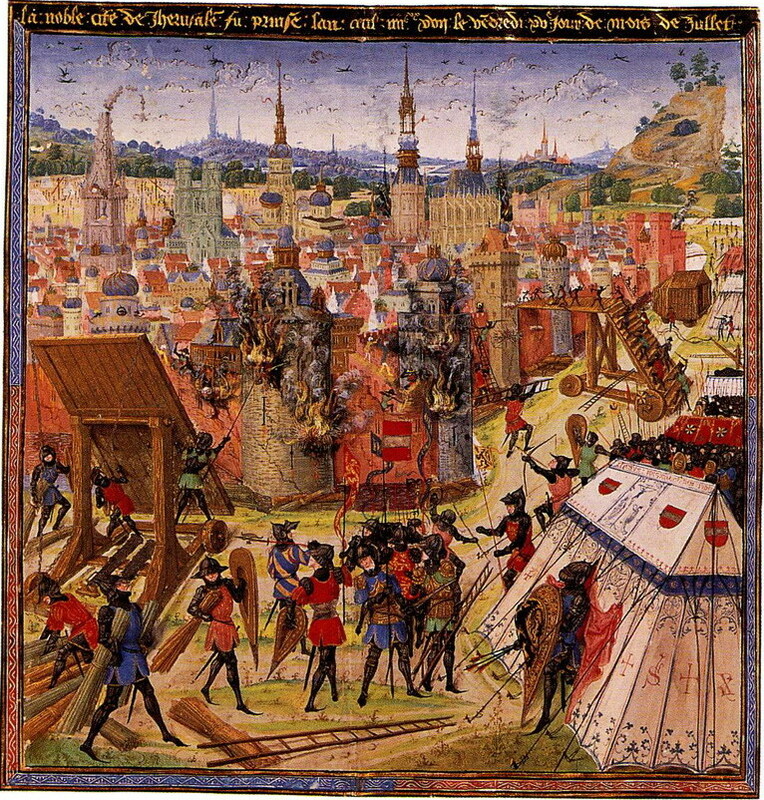 A History of the Crusades:The First Crusade and the Foundation of the Kingdom of Jerusalem. Penguin Books. Vol.1 pp.3–4. ↑ 57.0 57.1 Shalem, Yisrael. "The Early Arab Period - 638-1099". Ingeborg Rennert Center for Jerusalem Studies, Bar-Ilan University. http://www.biu.ac.il/js/rennert/history_8.html. Retrieved 2008-07-20. ↑ Hoppe, Leslie J. (August 2000). The Holy City: Jerusalem in the Theology of the Old Testament. Michael Glazier Books. p. 15. ISBN 0814650813. ↑ Zank, Michael. "Abbasid Period and Fatimid Rule (750–1099)". Boston University. http://www.bu.edu/mzank/Jerusalem/p/period4-3.htm. Retrieved 2007-02-01. ↑ Hull, Michael D. (June 1999). "First Crusade: Siege of Jerusalem". Military History. http://www.historynet.com/historical_conflicts/3028446.html?page=4&c=y. Retrieved 2007-05-18. ↑ 61.0 61.1 "Main Events in the History of Jerusalem". Jerusalem: The Endless Crusade. The CenturyOne Foundation. 2003. http://www.centuryone.com/hstjrslm.html. Retrieved 2007-02-02. ↑ Abu-Lughod, Janet L.; Dumper, Michael (2007). Cities of the Middle East and North Africa: A Historical Encyclopedia. ABC-CLIO. p. 209. http://books.google.com/books?id=3SapTk5iGDkC&printsec=frontcover&dq=Cities+of+the+Middle+East#PPA156,M1. Retrieved 2009-07-22. ↑ Jerusalem: Illustrated History Atlas Martin Gilbert, Macmillan Publishing, New York, 1978, p.25. Beshara, Doumani. (1995). Rediscovering Palestine: Egyptian rule, 1831-1840 University of California Press. ↑ Eylon, Lili (April 1999). "Jerusalem: Architecture in the Late Ottoman Period". Focus on Israel. Israel Ministry of Foreign Affairs. http://www.mfa.gov.il/mfa/mfaarchive/1990_1999/1999/4/focus%20on%20israel-%20jerusalem%20-%20architecture%20in%20the%20l. Retrieved 2007-04-20. ↑ Fromkin, David (2001-09-01). A Peace to End All Peace: The Fall of the Ottoman Empire and the Creation of the Modern Middle East (2nd reprinted ed.). Owl Books e. pp. 312–3. ISBN 0805068848. ↑ Tamari, Salim (1999). "Jerusalem 1948: The Phantom City" (Reprint). Jerusalem Quarterly File (3). Archived from the original on 2006-09-09. http://web.archive.org/web/20060909050148/http://www.library.cornell.edu/colldev/mideast/tamjer.htm. Retrieved 2007-02-02. ↑ 75.0 75.1 Eisenstadt, David (2002-08-26). "The British Mandate". Jerusalem: Life Throughout the Ages in a Holy City. Bar-Ilan University Ingeborg Rennert Center for Jerusalem Studies. http://www.biu.ac.il/JS/rennert/history_12.html. Retrieved 2007-02-10. ↑ 76.0 76.1 "History". The Hebrew University of Jerusalem. http://www.huji.ac.il/huji/eng/aboutHU_history_e.htm. Retrieved 2007-03-18. ↑ "Considerations Affecting Certain of the Provisions of the General Assembly Resolution on the "Future Government of Palestine": The City of Jerusalem". The United Nations. 1948-01-22. Archived from the original on 2008-01-26. http://web.archive.org/web/20080126145437/http://domino.un.org/unispal.nsf/52b7d0e66142a40e85256dc70072b982/6362111f689724d705256601007063f2!OpenDocument. Retrieved 2007-02-03. ↑ 78.0 78.1 Lapidoth, Ruth (1998-06-30). "Jerusalem: Legal and Political Background". Israel Ministry of Foreign Affairs. Archived from the original on 2007-08-07. http://web.archive.org/web/20070807025057/http://www.israel-mfa.gov.il/mfa/peace+process/guide+to+the+peace+process/jerusalem-+legal+and+political+background. Retrieved 2008-07-22. ↑ Benny Morris, 1948 (2008), pp.218–219. ↑ "Legal Status in Palestine". Birzeit University Institute of Law. http://lawcenter.birzeit.edu/iol/en/index.php?action_id=210. Retrieved 2008-07-22. ↑ P. R. Kumaraswamy (2000-03) (PDF). Beyond the Veil: Israel-Pakistan Relations. Tel Aviv, Israel: Jaffee Center for Strategic Studies, Tel Aviv University. Archived from the original on 2007-06-28. http://web.archive.org/web/20070628142556/http://www.tau.ac.il/jcss/memoranda/memo55.pdf. Retrieved 2009-07-22. ↑ Mitchell Bard. "Myths & Facts Online: Jerusalem". Jewish Virtual Library. http://www.jewishvirtuallibrary.org/jsource/myths/mf20.html#e. Retrieved 2009-07-22. ↑ Greg Noakes (September/October 1994). "Dispute Over Jerusalem Holy Places Disrupts Arab Camp". Washington report on Middle East affairs. http://www.washington-report.org/backissues/0994/9409011.htm. Retrieved 2008-07-20. ↑ "Jerusalem's Holy Places and the Peace Process". The Washington Institute for Near East Policy. 1988. http://www.washingtoninstitute.org/templateC04.php?CID=6. Retrieved 2008-07-20. ↑ "Basic Law- Jerusalem- Capital of Israel". Israeli Ministry of Foreign Affairs. 1980-07-30. http://www.mfa.gov.il/MFA/MFAArchive/1980_1989/Basic%20Law-%20Jerusalem-%20Capital%20of%20Israel. Retrieved 2008-07-20. ↑ "Resolution 478 (1980)". United Nations. 1980. http://daccessdds.un.org/doc/RESOLUTION/GEN/NR0/399/71/IMG/NR039971.pdf?OpenElement. Retrieved 2008-07-30. ↑ "'Western Wall was never part of temple'". Jerusalem Post. 2007-10-25. Archived from the original on 2007-10-27. http://web.archive.org/web/20071027091508/http://www.jpost.com/servlet/Satellite?cid=1192380646406&pagename=JPost/JPArticle/Printer. Retrieved 2008-07-20. ↑ "No Mid-East advance at UN summit". BBC. 2000-09-07. http://news.bbc.co.uk/1/hi/world/americas/913085.stm. Retrieved 2007-02-03. ↑ Khaled Abu Toameh (2007-01-11). "Abbas: Aim guns against occupation". The Jerusalem Post. http://www.jpost.com/servlet/Satellite?cid=1167467711961&pagename=JPost%2FJPArticle%2FShowFull. Retrieved 2007-02-03. ↑ Cabrera, Enrique; Jorge García-Serra (1998-12-31). Drought Management Planning in Water Supply Systems. Springer. p. 304. ISBN 0792352947. "The Old City of Jerusalem (760 m) in the central hills"
↑ 100.0 100.1 Bergsohn, Sam (2006-05-15). "Geography". Cornell University. http://instruct1.cit.cornell.edu/courses/nes263/spring06/scb48/Final%20Website/Geography%20Page.html. Retrieved 2007-02-09. ↑ Walvoord, John; Zachary J. Hayes, Clark H. Pinnock, William Crockett, and Stanley N. Gundry (1996-01-07). "The Metaphorical View". Four Views on Hell. Zondervan. p. 58. ISBN 0310212685. ↑ "Jerusalem geography". Jewish Agency. http://www.jafi.org.il/education/100/places/jer.html. Retrieved 2008-07-08. ↑ Rosen-Zvi, Issachar (June 2004). Taking Space Seriously: Law, Space and Society in Contemporary Israel. Ashgate Publishing. p. 37. ISBN 0754623513. "Thus, for instance, the distance between the four large metropolitan regions are—39 miles"
↑ Federman, Josef (2004-08-18). "Debate flares anew over Dead Sea Scrolls". AP via MSNBC. http://www.msnbc.msn.com/id/5750610/. Retrieved 2007-02-09. ↑ 109.0 109.1 "Monthly Averages for Jerusalem, Israel". The Weather Channel. http://www.weather.com/outlook/travel/businesstraveler/wxclimatology/monthly/graph/ISXX0010?from=month_bottomnav_business. Retrieved 2007-02-07. ↑ 110.0 110.1 Ma'oz, Moshe; Sari Nusseibeh (March 2000). Jerusalem: Points of Friction-And Beyond. Brill Academic Publishers. pp. 44–6. ISBN 9041188436. ↑ Rory Kess (September 16, 2007). "Worst ozone pollution in Beit Shemesh, Gush Etzion". The Jerusalem Post. http://www.jpost.com/servlet/Satellite?cid=1189411414621&pagename=JPost%2FJPArticle%2FShowFull. Retrieved 2007-10-23. ↑ "Population and Density per km² in Localities Numbering Above 5,000 Residents on 31 XII 2005" (PDF). Israel Central Bureau of Statistics. 2006. http://www1.cbs.gov.il/shnaton57/st02_14.pdf. Retrieved 2007-04-11. ↑ Sel, Neta (2006-05-23). "Jerusalem: More tourists, fewer Jews". YNet. http://www.ynetnews.com/articles/0,7340,L-3254277,00.html. Retrieved 2007-03-10. ↑ Hockstader, Lee (1998-08-16). "Jewish Drop In Jerusalem Worries Israel". The Washington Post via Cornell University. Archived from the original on 2006-09-09. http://web.archive.org/web/20060909060853/http://www.library.cornell.edu/colldev/mideast/jerus.htm. Retrieved 2007-03-10. ↑ "Most Jerusalemites Attend Hareidi-Religious Schools". Arutz Sheva. 2009-05-21. http://www.israelnationalnews.com/News/Flash.aspx/165421. Retrieved 2009-05-21. ↑ Nadav Shragai (2009-05-21). "Most of Jerusalem's non-Jewish children live below poverty line". Haaretz. http://www.haaretz.com/hasen/spages/1086819.html. Retrieved 2009-05-21. ↑ Richard Boudreaux (June 5, 2007). "Clashing values alter a city's face". Los Angeles Times. http://www.latimes.com/news/nationworld/world/la-fg-orthodox5jun05,1,1841144.story?page=2&coll=la-util-nationworld-world. Retrieved 2009-07-22. ↑ Greg Myre (May 13, 2007). "Israeli Riddle: Love Jerusalem, Hate Living There". New York Times. http://www.nytimes.com/2007/05/13/weekinreview/13myre.html?_r=2&oref=slogin. Retrieved 2009-07-22. ↑ Ken Ellingwood (June 4, 2007). "Change cast in concrete". Los Angeles Times. http://www.latimes.com/news/nationworld/world/la-fg-barrier4jun04,1,5137437.story?coll=la-util-nationworld-world. Retrieved 2009-07-22. ↑ Ken Ellingwood (June 4, 2007). "Change cast in concrete". Los Angeles Times. http://www.latimes.com/news/nationworld/world/la-fg-barrier4jun04,1,5853828,full.story. Retrieved 2009-07-22. ↑ 122.0 122.1 Laub, Karin (2006-12-02). "Jerusalem Barrier Causes Major Upheaval". The Associated Press via The Washington Post. http://www.washingtonpost.com/wp-dyn/content/article/2006/12/02/AR2006120200463_pf.html. Retrieved 2007-03-10. ↑ 130.0 130.1 Cidor, Peggy (2007-03-15). "Corridors of Power: A tale of two councils". The Jerusalem Post. http://www.jpost.com/servlet/Satellite?cid=1173879092720&pagename=JPost%2FJPArticle%2FShowFull. Retrieved 2007-03-28. ↑ Coker, Margaret (2006-11-11). "Jerusalem Becomes A Battleground Over Gay Rights Vs. Religious Beliefs". Cox Newspapers. Archived from the original on 2007-12-23. http://web.archive.org/web/20071223111106/http://www.coxwashington.com/hp/content/reporters/stories/2006/11/11/BC_ISRAEL_GAYS10_COX.html. Retrieved 2007-03-28. ↑ "Safra Square - City Hall". The Municipality of Jerusalem. http://www.jerusalem.muni.il/jer_sys/picture/atarim/site_form_atar_eng.asp?site_id=147&pic_cat=2&icon_cat=6&york_cat=7. Retrieved 2007-04-24. ↑ 133.0 133.1 Ben-Gurion, David (1949–12–05). "Statements of the Prime Minister David Ben-Gurion Regarding Moving the Capital of Israel to Jerusalem". The Knesset. http://www.knesset.gov.il/docs/eng/bengurion-jer.htm. Retrieved 2007–04–02. ↑ "Jerusalem and Berlin Embassy Relocation Act of 1998". The Library of Congress. 1998-06-25. http://thomas.loc.gov/cgi-bin/query/z?c105:H.R.4181.IH:. Retrieved 2007-02-12. ↑ "Basic Law: Jerusalem, Capital of Israel". Israel Ministry of Foreign Affairs. 1980-07-30. http://www.mfa.gov.il/MFA/MFAArchive/1980_1989/Basic%20Law-%20Jerusalem-%20Capital%20of%20Israel. Retrieved 2007-04-02. ↑ "The Status of Jerusalem". Israel Ministry of Foreign Affairs. 1999–03–14. http://www.mfa.gov.il/MFA/MFAArchive/1990_1999/1999/3/The%20Status%20of%20Jerusalem. Retrieved 2007–02–12. ↑ 137.0 137.1 "Embassies and Consulates in Israel". Israel Science and Technology Homepage. http://www.science.co.il/Embassies.asp. Retrieved 2007–05–03. ↑ Kellerman, Aharon (January 1993). Society and Settlement: Jewish Land of Israel in the Twentieth Century. State University of New York Press. p. 140. ISBN 0791412954. "[Tel Aviv] also contains most embassies, given the nonrecognition by many countries of Jerusalem as the capital of Israel." ↑ "Jerusalem Embassy Act of 1995". U.S. Government Printing Office. 1995-11-08. http://www.gpo.gov/fdsys/pkg/PLAW-104publ45/content-detail.html. Retrieved 2007-02-15. ↑ "Statement on FY 2003 Foreign Relations Authorization Act". http://georgewbush-whitehouse.archives.gov/news/releases/2002/09/print/20020930-8.html. Retrieved 2007-05-23. ↑ "English gateway to the Knesset website". http://www.knesset.gov.il/main/eng/home.asp. Retrieved 2007-05-18. ↑ "The State of Israel: The Judicial Authority". http://elyon1.court.gov.il/eng/home/index.html. Retrieved 2007-05-18. Orfali, Jacob G. (March 1995). Everywhere You Go, People Are the Same. Ronin Publishing. p. 25. ISBN 0914171755. "In the year 1923, [Jerusalem] became the capital of the British Mandate in Palestine"
Oren-Nordheim, Michael; Ruth Kark (September 2001). Jerusalem and Its Environs: Quarters, Neighborhoods, Villages, 1800–1948. Wayne State University Press. p. 36. ISBN 0814329098. "The three decades of British rule in Palestine (1917/18–1948) were a highly significant phase in the development, with indelible effects on the urban planning and development of the capital – Jerusalem." Ruth Kark is a professor in the Department of Geography at the Hebrew University of Jerusalem. Dumper, Michael (1996-04-15). The Politics of Jerusalem Since 1967. Columbia University Press. p. 59. ISBN 0231106408. "...the city that was to become the administrative capital of Mandate Palestine..."
↑ Dore Gold. "Jerusalem in International Diplomacy". http://www.jcpa.org/jcprg10.htm. Retrieved 2008-07-20. ↑ "The New Orient House: A History of Palestinian Hospitality". jerusalemites.org. http://www.jerusalemites.org/jerusalem/cultural_dimensions/3.htm. Retrieved 2008-07-20. ↑ Klein, Menachem (March 2001). "The PLO and the Palestinian Identity of East Jerusalem". Jerusalem: The Future of a Contested City. New York University Press. p. 189. ISBN 081474754X. ↑ Guinn, David E. (2006-10-02). Protecting Jerusalem's Holy Sites: A Strategy for Negotiating a Sacred Peace (1st ed.). Cambridge University Press. p. 142. ISBN 0521866626. ↑ "What is the Western Wall?". The Kotel. http://english.thekotel.org/content.asp?id=212. Retrieved 2007-03-06. ↑ Goldberg, Monique Susskind. "Synagogues". Ask the Rabbi. Schechter Institute of Jewish Studies. Archived from the original on 2008-01-31. http://web.archive.org/web/20080131205934/http://www.schechter.edu/askrabbi/synagoguetemple.htm. Retrieved 2007-03-10. ↑ 151.0 151.1 Segal, Benjamin J. (1987). Returning: The Land of Israel as Focus in Jewish History. Jerusalem, Israel: Department of Education and Culture of the World Zionist Organization. p. 124. http://www.jewishhistory.com/jh.php?id=AdditionalReadings&content=content/segal_ch12. Retrieved 2007-03-10. ↑ The Jewish injunction to pray toward Jerusalem comes in the Orach Chayim section of Shulchan Aruch (94:1) — "When one rises to pray anywhere in the Diaspora, he should face towards the Land of Israel, directing himself also toward Jerusalem, the Temple, and the Holy of Holies." ↑ Boas, Adrian J. (2001-10-12). "Physical Remains of Crusader Jerusalem". Jerusalem in the Time of the Crusades. Routledge. p. 112. ISBN 0415230004. "The interesting, if not reliable illustrations of the church on the round maps of Jerusalem show two distinct buildings on Mount Zion: the church of St Mary and the Cenacle (Chapel of the Last Supper) appear as separate buildings." ↑ Endo, Shusaku (1999). Richard A. Schuchert. ed. A Life of Jesus. Paulist Press. p. 116. ISBN 0809123193. ↑ 158.0 158.1 Stump, Keith W. (1993). "Where Was Golgotha?". Worldwide Church of God. http://www.wcg.org/lit/jesus/golgotha.htm. Retrieved 2007-03-11. ↑ Ray, Stephen K. (October 2002). St. John's Gospel: A Bible Study Guide and Commentary for Individuals and Groups. San Francisco, CA: Ignatius Press. p. 340. ISBN 0898708214. ↑ O'Reilly, Sean; James O'Reilly (2000-11-30). Pilgrimage: Adventures of the Spirit (1st ed.). Travelers' Tales. p. 14. ISBN 1885211562. "The general consensus is that the Church of the Holy Sepulchre marks the hill called Golgotha, and that the site of the Crucifixion and the last five Stations of the Cross are located under its large black domes." ↑ Cordesman, Anthony H. (2005-10-30). "The Final Settlement Issues: Asymmetric Values & Asymmetric Warfare". The Israeli-Palestinian War: Escalating to Nowhere. Praeger Security International. p. 62. ISBN 0275987582. ↑ Peters, Francis E. (2003-10-20). "Muhammad the Prophet of God". The Monotheists: The Peoples of God. Princeton University Press. pp. 95–6. ISBN 0691114609. ↑ "The Early Arab Period - 638-1099". Jerusalem: Life Throughout the Ages in a Holy City. Bar-Ilan University Ingeborg Rennert Center for Jerusalem Studies. March 1997. http://www.biu.ac.il/js/rennert/history_8.html. Retrieved 2007-04-24. ↑ 166.0 166.1 "About the Museum". The Israel Museum, Jerusalem. http://www.imj.org.il/eng/about/index.html. Retrieved 2007-02-27. ↑ "Shrine of the Book". The Israel Museum, Jerusalem. http://www.imj.org.il/eng/shrine/index.html. Retrieved 2007-02-27. ↑ "The Rockefeller Archaeological Museum". The Israel Museum, Jerusalem. http://www.imj.org.il/eng/branches/rockefeller/index.html. Retrieved 2007-02-28. ↑ "The Rockefeller Archaeological Museum: About the Museum: The Permanent Exhibition". The Israel Museum, Jerusalem. Archived from the original on 2007-12-11. http://web.archive.org/web/20071211171315/http://www.imj.org.il/eng/branches/rockefeller/permanent.html. Retrieved 2007-02-28. ↑ "Yad Vashem". The Holocaust Martyrs' and Heroes' Remembrance Authority. http://www.yadvashem.org/. Retrieved 2007-02-28. ↑ "About Yad Vashem". The Holocaust Martyrs' and Heroes' Remembrance Authority. http://www1.yadvashem.org/about_yad/index_about_yad.html. Retrieved 2007-02-28. ↑ "The Museum". Museum On The Seam. http://www.mots.org.il/eng/museum/about.asp. Retrieved 2008-07-20. ↑ 173.0 173.1 "History". Jerusalem Orchestra. http://www.jso.co.il/history_english.php. Retrieved 2007-03-04. ↑ "Jerusalem Music Center". http://www.jmc.co.il/Default.asp. Retrieved 2007-05-18. ↑ "The Jerusalem Centre for the Performing Arts". Jerusalem Theater. http://www.jerusalem-theatre.co.il/about_en.asp. Retrieved 2007-03-04. ↑ "About Us". The Khan Theatre. 2004. http://www.khan.co.il/about/index_english.php. Retrieved 2007-03-04. ↑ "Summer Nights Festival 2008". Jerusalem Foundation. http://www.jerusalemfoundation.org/news_article.aspx?MID=547&CID=558&AID=738&ID=2452. Retrieved 2008-07-20. ↑ "About The Festival". Jerusalem Film Festival. http://www.jff.org.il/?CategoryID=361&ArticleID=163&sng=1. Retrieved 2008-07-20. ↑ "Ticho House". The Israel Museum, Jerusalem. http://www.imj.org.il/eng/branches/Ticho_house/index.html. Retrieved 2007-02-28. ↑ "About Alhoash". Palestinian ART Court. http://www.alhoashgallery.org/aboutus.shtml. Retrieved 2008-07-20. ↑ 181.0 181.1 "Israel bans Palestinian cultural events - Israel News, Ynetnews". Ynetnews.com. 1995-06-20. http://www.ynetnews.com/articles/0,7340,L-3689673,00.html. Retrieved 2010-01-22. ↑ "History". Palestinian National Theatre. http://www.pnt-pal.org/history.php. Retrieved 2007-03-04. ↑ Joel Epstein, "Teaching in Palestine", The Strad June 2009, p. 42. ↑ "List of Palestinian Cultural & Archeological Sites". Jerusalem Media & Communication Centre. http://www.jmcc.org/palculture/go.htm. Retrieved 2008-07-20. ↑ Joel Epstein, "Teaching in alestine", The Strad June 2009, p. 42. ↑ ”Speaking Art” Conference: Jewish-Arab Dialogue Through the Arts at the Jerusalem Intercultural Center. ↑ KERSHNER, Isabel (2008-10-17). "Symbol of Peace Stands at Divide Between Troubled Jerusalem's East and West". New York Times. http://www.nytimes.com/2008/10/18/world/middleeast/18jerusalem.html?_r=1&scp=1&sq=tolerance%20monument&st=cse&oref=slogin. Retrieved 2008-10-18. ↑ 190.0 190.1 190.2 190.3 Dumper, Michael (1996-04-15). The Politics of Jerusalem Since 1967. Columbia University Press. pp. 207–10. ISBN 0231106408. ↑ 191.0 191.1 "Study shows poverty level in Jerusalem double that of other Israeli cities". Israel Insider. 2007-01-11. http://web.israelinsider.com/Articles/Briefs/10317.htm. Retrieved 2007-03-11. ↑ "Employed Persons, by Industry, District and Sub-District of Residence, 2005" (PDF). Israeli Central Bureau of Statistics. http://www1.cbs.gov.il/shnaton57/st12_14x.pdf. Retrieved 2007-04-11. ↑ Gil Zohar (June 28, 2007). "Bet your bottom dollar?". The Jerusalem Post. Archived from the original on 2008-02-03. http://web.archive.org/web/20080203230544/http://www.jpost.com/servlet/Satellite?cid=1182951036437&pagename=JPost/JPArticle/ShowFull. Retrieved 2007-07-10. ↑ "Har Hotzvim Industrial Park". Har Hotzvim Industrial Park. http://www.hotzvim.org.il/SiteFiles/1/35/901.asp. Retrieved 2007-03-13. ↑ Smith, Patrick (2006-06-09). "Ask the Pilot". Salon. http://www.salon.com/tech/col/smith/2006/06/09/askthepilot189/index1.html. Retrieved 2007-03-14. ↑ Solomon, Shoshanna (2001-11-01). "Facets of the Israeli Economy – Transportation". Israel Ministry of Foreign Affairs. http://www.mfa.gov.il/MFA/MFAArchive/2000_2009/2001/11/Facets%20of%20the%20Israeli%20Economy-%20Transportation. Retrieved 2007-03-14. ↑ "Solution". Jerusalem Mass Transit System Project. http://www.rakevetkala-jerusalem.org.il/ENB2.html. Retrieved 2007-03-17. ↑ 198.0 198.1 Afra, Orit (2007-02-08). "Panacea or pain?". The Jerusalem Post. Archived from the original on 2008-02-03. http://web.archive.org/web/20080203224846/http://www.jpost.com/servlet/Satellite?pagename=JPost/JPArticle/ShowFull&cid=1170359814381. Retrieved 2007-03-17. ↑ "Jerusalem Light Rail Project". Railway Technology. http://www.railway-technology.com/projects/jerusalem/. Retrieved 2008-11-22. ↑ "Life in Jerusalem – Transportation". Rothberg International Station – Hebrew University of Jerusalem. http://overseas.huji.ac.il/campus.asp?cat=277&in=275. Retrieved 2007-03-14. ↑ "Passenger Lines Map". Israel Railways. Archived from the original on 2007-10-06. http://web.archive.org/web/20071006052152/http://www.israrail.org.il/english/travel/map.html. Retrieved 2007-03-14. ↑ 203.0 203.1 Burstein, Nathan (2006-01-19). "Running rings around us". The Jerusalem Post. Archived from the original on 2008-02-03. http://web.archive.org/web/20080203230517/http://www.jpost.com/servlet/Satellite?apage=1&cid=1137605873879&pagename=JPost/JPArticle/ShowFull. Retrieved 2007-03-17. ↑ Gil Zohar (May 31, 2007). "Their way or the highway?". The Jerusalem Post. Archived from the original on 2008-02-03. http://web.archive.org/web/20080203221925/http://www.jpost.com/servlet/Satellite?cid=1180527974291&pagename=JPost/JPArticle/ShowFull. Retrieved 2007-06-11. ↑ "Times Higher Education". Times Higher Education. 2008-10-09. http://www.timeshighereducation.co.uk/hybrid.asp?typeCode=243&pubCode=1. Retrieved 2009-05-05. ↑ Hershko, Avram. "Avram Hershko". The Nobel Foundation. http://nobelprize.org/nobel_prizes/chemistry/laureates/2004/hershko-autobio.html. Retrieved 2007-03-18. ↑ Gross, David. "David J. Gross". The Nobel Foundation. http://nobelprize.org/nobel_prizes/physics/laureates/2004/gross-autobio.html. Retrieved 2007-03-18. ↑ Kahneman, Daniel. "Daniel Kahneman". The Nobel Foundation. http://nobelprize.org/nobel_prizes/economics/laureates/2002/kahneman-autobio.html. Retrieved 2007-03-18. ↑ "About the Library: Main Collections". Jewish National and University Library. http://www.jnul.huji.ac.il/eng/col_general.html. Retrieved 2007-03-27. ↑ "About the Library: History and Aims". Jewish National and University Library. http://www.jnul.huji.ac.il/eng/history.html. Retrieved 2007-03-27. ↑ 211.0 211.1 "Science & Technology". al-Quds University. http://www.alquds.edu/faculties/science/index.php?page=overview. Retrieved 2007-03-19. ↑ "Urgent Appeal". al-Quds University. http://www.alquds.edu/press/urgent_appeal.php. Retrieved 2007-03-27. ↑ "About JCT". Jerusalem College of Technology. Archived from the original on 2008-02-01. http://web.archive.org/web/20080201120754/http://www.jct.ac.il/NR/exeres/56FCED6F-06D1-4E02-8C2F-15E36061D279.htm. Retrieved 2007-03-25. ↑ Wohlgelernter, Elli (2000-12-28). "The village of Mir, where Torah once flowed". Jewish Agency for Israel. Archived from the original on 2008-02-02. http://web.archive.org/web/20080202163159/http://www.jewishagency.org/JewishAgency/English/Home/About/Press+Room/Jewish+Agency+In+The+News/2000+and+before/jpdec28.htm+188.htm. Retrieved 2007-03-26. ↑ Jonathan Lis (May 4, 2005). "The best medicine for Jerusalem". http://www.haaretz.com/hasen/pages/ShArt.jhtml?itemNo=572046. Retrieved 2009-07-22. ↑ 218.0 218.1 "Summary". Second Class Discrimination Against Palestinian Arab Children in Israel's Schools. Human Rights Watch. September 2001. http://www.hrw.org/reports/2001/israel2/ISRAEL0901-01.htm. Retrieved 2007-03-27. ↑ 220.0 220.1 Lis, Jonathan (2008-04-21). "Mayor to raise funds for E. J'lem Arabs to block Hamas". Haaretz. http://www.haaretz.com/hasen/spages/976126.html. Retrieved 2008-07-20. ↑ Or Kashti (March 18, 2007). "8,000 new classrooms to be built in Arab, ultra-Orthodox schools". http://www.haaretz.com/hasen/spages/839099.html. Retrieved 2009-07-22. ↑ Torstrick, Rebecca L. (2004-06-30). Culture and Customs of Israel. Greenwood Press. p. 141. ISBN 0313320918. "The two most popular spectator sports in Israel are football and basketball." ↑ Griver, Simon (October 1997). "Betar Jerusalem: A Local Sports Legend Exports Talent to Europe's Top Leagues". Israel Magazine via the Israel Ministry of Foreign Affairs. Archived from the original on 2007-12-31. http://web.archive.org/web/20071231081639/http://www.israel-mfa.gov.il/MFA/Israel+beyond+the+conflict/Betar+Jerusalem-+A+Local+Sports+Legend+Exports+Tal. Retrieved 2007-03-07. ↑ Eldar, Yishai (2001-12-01). "Jerusalem: Architecture Since 1948". Israeli Ministry of Foreign Affairs. http://www.mfa.gov.il/mfa/mfaarchive/2000_2009/2001/12/focus%20on%20israel-%20jerusalem%20-%20architecture%20since%2019. Retrieved 2007-03-07. ↑ "Online Directory: Israel, Middle East". Sister Cities International. Archived from the original on 2008-01-17. http://web.archive.org/web/20080117184923/http://www.sci-icrc.org/icrc/directory/MiddleEast/Israel. Retrieved 2007-04-05. ↑ "New York City Global Partners". NYC.gov. http://www.nyc.gov/html/unccp/scp/html/sc/main.shtml. Retrieved 2008-02-17. ↑ Pellegrino, Charles R. (1995-12-01). Return to Sodom & Gomorrah (Second revised ed.). Harper Paperbacks. p. 271. ISBN 0380726335. "[see footnote]"
↑ Marcus, Jacob Rader (March 2000). The Jew in the Medieval World: A Source Book, 315–1791 (Revised ed.). Hebrew Union College Press. pp. 13–15. ISBN 087820217X. http://www.fordham.edu/halsall/jewish/jews-umar.html. Retrieved 2007-02-01. ↑ Jonsson, David J. (2005-02-19). The Clash of Ideologies. Xulon Press. p. 256. ISBN 1597810398. "During the reign of Umar, the Pact of Umar was established." ↑ Goddard, Hugh (2001-04-25). A History of Christian-Muslim Relations. New Amsterdam Books. p. 46. ISBN 1566633400. "Although the documents are attributed to `Umar, in all probability they actually come from the second Islamic century... The covenant was drawn up in the schools of law, and came to be ascribed, like so much else, to `Umar I"
↑ Goddard, Hugh (2001-04-25). A History of Christian-Muslim Relations. New Amsterdam Books. p. 47. ISBN 1566633400. "It has recently been suggested that many of the detailed regulations concerning what the ahl al-dhimma were and were not permitted to do come from an earlier historical precedent, namely the regulations which existed in the Sassanian Persian Empire with reference to its religious minorities in Iraq."